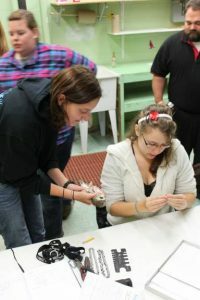 We banded 35 saw whets this season. It was a pretty wet season and we probably would have banded quite a few more if it did not rain all the time, but it was very successful. The nets openned on 14 September for the first full season of the Paul Smiths Saw Whet Owl Banding Station. We caught 3 owls in the first 4 days. One day we were rained out and one day we closed very early. Banding a hawk owl in Potsdam, NY. Today was a huge day for me and my kestrel Fran. We got her from a nest box in late June and have been training her to come to us. Today, we free flew her off the leash. She came to me 6 times and avoided me when I tried to put her back on the leash. But finally, we got her safe and sound back in the house. Our first day of free flying is under our belt! Busy day for me and the birds today. Will be in Potsdam at the Tractor Supply at 10 AM, Pal Smith’s Visitor Interpretive Center at 2 PM and finally the Lake Placid Lodge at 5 PM. Come join us if you have the time! 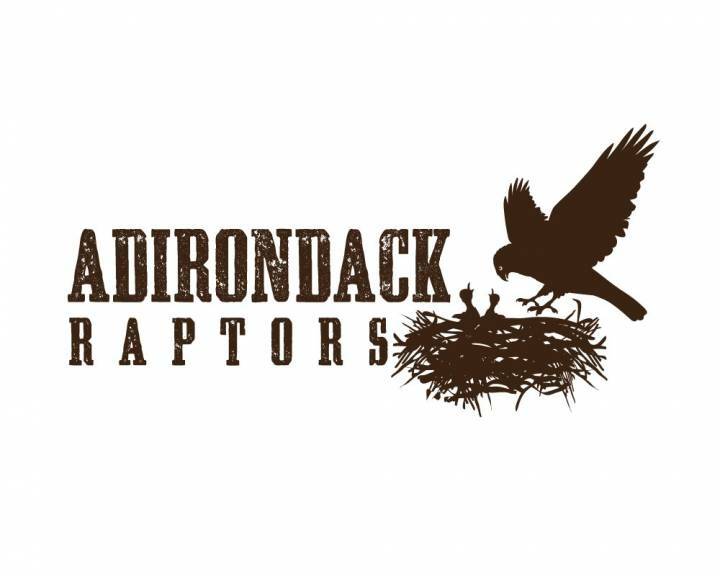 Adrondack Raptorswill be at the Great Camp Sagamore in Racquette Lake, NY today at 2:15 PM. If you are in the area stop on in and enjoy the show. The documentary was made after the first 9 years of the project. I am sitting here at my computer with my kestrel, Fran, sitting on my left hand.. We are working very hard to gain a stronger bond and get her ready for starlings. 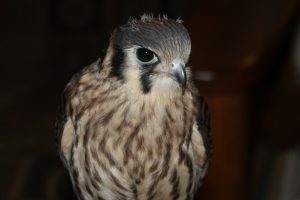 There is something peaceful about listening to a falcon chirp to you while you are working. 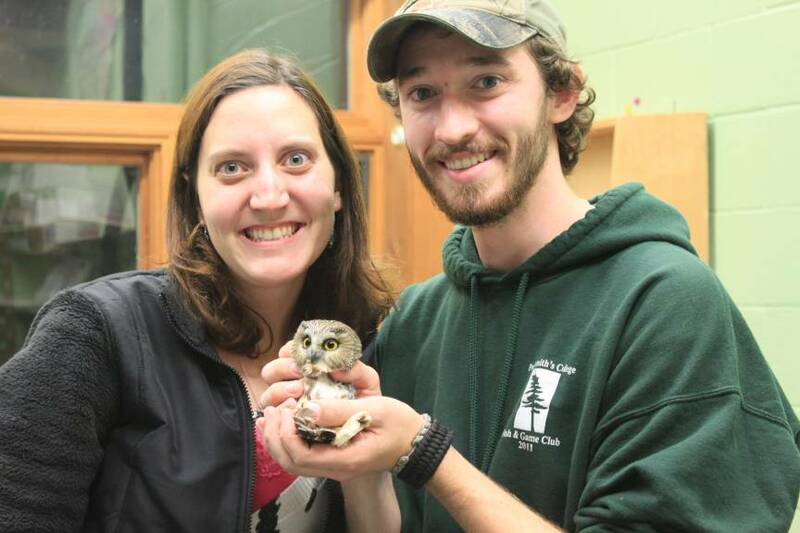 The staff at ADK Raptors is excited to bring you our new web page format just in time to prepare for the upcoming Northern Saw Whet Owl Banding Station season. We will begin conducting the station on 14 September 2012 and will run through 4 November. Come and join us for a day catching and banding the Northeastern United States’ smallest owl. 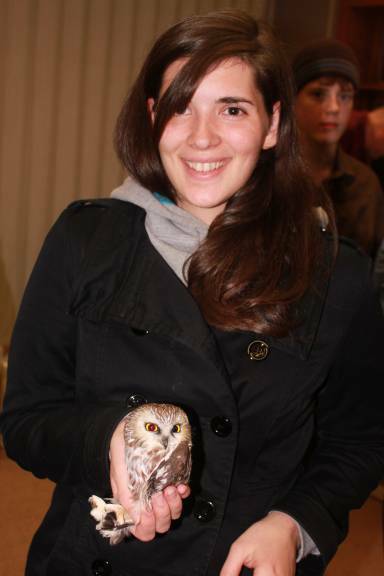 Kait with one of the first northern saw whet owls captured at the Paul Smiths Banding Station in the northern Adirondacks.